We all experience some anxiety throughout our lifetime, but seniors are particularly at risk. What percentage of anxiety is productive vs. debilitating depends on a person’s ability to cope with it. If you are caring for your elderly parent(s), most likely you recognize that they have fears and anxieties. Some of these fears may seem rational and some might seem irrational. Regardless of your perception, they are very real to your senior, and you need to treat them as such. 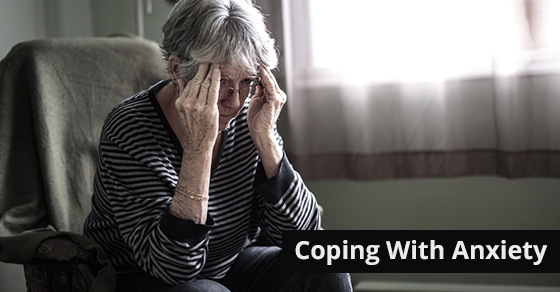 So how exactly do your help seniors cope with anxiety? Here are some tips. If you want to make your loved one less fearful, start by discovering what exactly is making them feel insecure and anxious. It is perfectly natural that your aging loved one has some anxiety. They might have dealt with a loss, like that of a spouse, or maybe numerous friends have passed away recently. Loneliness can cause anyone to be depressed and anxious. If they are dealing with physical issues, it could be fear of falling with no one around to help. Maybe they are worried about money and don’t want to tell you. Sometimes your senior knows they are becoming forgetful, and of course that would make anyone be on edge. Change is a big challenge for seniors, like moving or meeting new people. Anxiety can take many forms. Once you discover if your parent or loved one has a specific fear, or if there anxiety is more general,, you can decide how to help. When a senior is anxious about everything, or life in general, it is known as General Anxiety Disorder, or GAD. Draw them out and get them to identify their fears. You will shortly be able to discover if there is a specific cause for their anxiety or if it is GAD. If you provide senior care in Toronto, and if it appears to be GAD, or general anxiety disorder, a visit to their physician is in order. It could be their medication or a change to their meds is affecting their disposition. How well do they sleep? How much coffee do they drink everyday? Do they relax every evening with a drink or two? The combination of caffeine and alcohol affects their ability to sleep and can lead to general anxiety. If going out of the house and meeting new people worries them, take them to some senior activities in your area. Share the responsibility with loved ones and pick a specific day of the week or month so your senior can look forward to it. If they are fearful of falling down, seek out a professional caregiver like C-Care Health Services to provide care when you cannot be there. If there are physical issues, take them for walks, enroll them in a water aerobics class for seniors, and encourage more activity. Remember that laughter is contagious. Keeping upbeat and smiling can change their mood and help them forget their fears. You don’t have to do this alone! Seek help from a professional service like C Care Health Services in Toronto. Their caregivers are trained to handle anxiety in seniors and calm their fears with compassion.